I’ll admit it: my dream wedding is completely stitched together via 205 pins on my Pinterest page. But if you clicked on any one of those pins, you’d soon discover those pinterest-perfect ideas are also bank-breaking ideas. I’m a DIY girl at heart, and I love the idea of making my own wedding decorations from the invites to the table settings. And let’s not forget the jewelry. 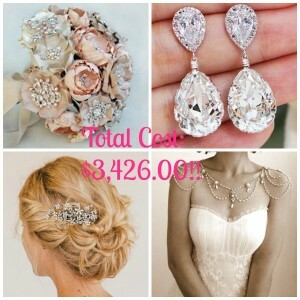 I flipped through Jean Campbell’s eBook, Beaded Weddings Inspiration Book: 39 Projects and Dozens of Tips for Your Beautiful Bridal Ensemble, and was intrigued by what it may cost to make my own jewelry/hair pieces/dress embellishments, etc. from the designs in this book vs if I were to buy some items from my wish-list on Pinterest. The comparison is shocking! I love the idea of making my own wedding accessories for many reasons. First, it will save me thousands of dollars. Second, I can customize great ideas to fit my exact needs, such as the length of a necklace that will look best with my dress neckline, or a pearl that is slightly more pink to match the flowers in my bouquet. Third, it’s extremely personal. I feel so much more pride donning something I created versus something that any other bride may be flaunting. 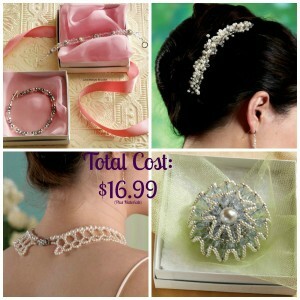 I also love the idea of making similar jewelry and accessories for my bridesmaids. If you are interested in creating wedding jewelry (for yourself, friends, daughters, etc. ), don’t go about the task without Jean Campbell’s digital book, Beaded Weddings Inspiration Book: 39 Projects and Dozens of Tips for Your Beautiful Bridal Ensemble. Jean and fellow designers teach you to easily embroider wedding gowns and veils, create hair pieces for brides and flower girls, work up broaches for shoes, dresses, and more, and finish it all off with beautiful bracelet, necklace, and earring designs. Say “I do” to a DIY accessorized wedding, and never look back! *OTHER FUN NEWS: Receive 50-80% off a huge selection of books in categories ranging from beading and crochet to knitting, quilting, and sewing at: interweave.com/deals! Deal ends June 16th, so don’t miss out! **Pinterest images. Top Left: Wedding Bee. Top Right: EarringsNation. Bottom Left: UntamedPetals. Bottom Right: MyLittleBride.